Thus you won't be forced to change the food as often as it will remain fresh and tasty for longer. 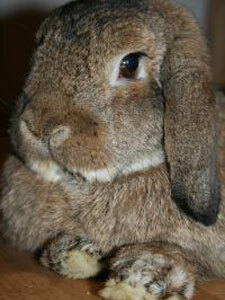 If a pet rabbit is being kept outside it is essential to provide it with a large home. 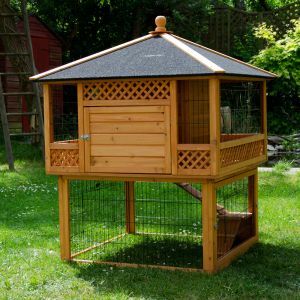 When selecting an outdoor rabbit hutch there is quite a lot to be considered. First, it is essential to know the adult size to which the rabbit will grow. As a rough guide, the hutch should allow an adult rabbit to sit up on its hind legs and to stretch out. Most people still opt for the traditional wooden outdoor rabbit hutch. Outdoor rabbit hutches should have a living area with a strong wire-mesh door and a partitioned sleeping area with a solid door. Outdoor rabbit hutches must be raised on legs to give protection from damp and to deter vermin and predators such as cats and foxes. The hutch roof should be covered with roofing felt, sloped to allow water to run-off and have an overhang. Rabbits cannot tolerate damp, drafts or excess heat so make sure that you position the outdoor rabbit hutch in a sheltered area out of direct sunlight or driving snow and rain. 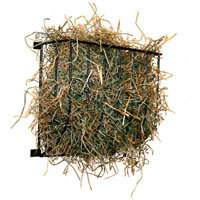 Don't forget to provide extra warmth in the form of extra dry bedding in the colder months. Make sure the hutch is draught-free and fully weatherproof and regularly maintained using a non-toxic wood preserving treatment. The roof should also be weatherproof and slope backward to allow rain to drain off. Strong wire mesh must be used on the front of the living quarters. Check that there are no rough edges on which the rabbit could injure itself. Each year, many pet rabbits are snatched from gardens by predators - particularly urban foxes. 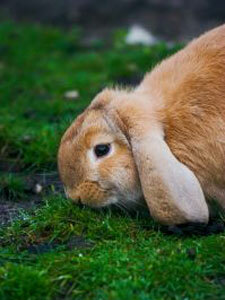 You must protect your rabbits from attack by dogs, cats, foxes and birds of prey. Rabbits need space and exercise, they are active animals, and can develop painful skeletal problems if kept permanently in a hutch: Daily exercise outside the hutch is vital. It is not recommended that adult rabbits share a hutch with guinea pigs – rabbits naturally frolic and kick which could injure guinea pigs.